We receive dog training requests from outside of MA and NH that wouldn’t be practical for us to fulfill. If you live outside of New England and want to find the best dog trainer possible, we urge you to follow the guide below in making your selection. You can find great results if you know what to look for. If you’re interested in puppy training, on and off-leash obedience, or behavior modification and do live in MA or NH, look no further—contact us today! 1. What is their experience with training dogs? The best dog trainers are those with years of experience in everything from off-leash obedience training to behavior modification. The instincts, timing, and problem solving skills needed to train dogs only come with time. It doesn’t matter if the trainer took classes to become an animal behaviorist. It doesn’t matter how long they worked as a vet tech or groomer. All that matters is hands-on training experience with proven results. You want to see evidence that shows they have been doing this as a serious career for as long as they claim. For instance, if they taught their puppy to “shake” when they were 6, they could claim that they “began training dogs decades ago.” What you really want to see is a testimonial from a client who worked with the trainer a number of years ago and is still happy with the results. 2. What kind of results do they promise? Specifically, ask the trainer what kind of results you can expect and what the timeline is. The timeline is an estimate, of course, but we have heard from clients who went to a trainer to eliminate a behavior and instead were given-leash obedience tricks. Dog training is a broad subject, so get specific about exactly what behaviors you want to create and eliminate, and confirm with the trainer that this is feasible. 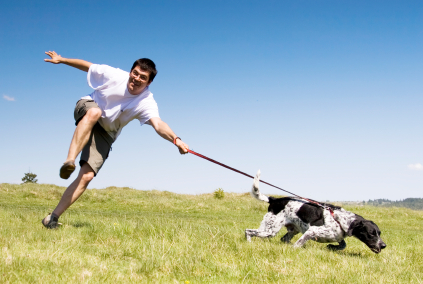 If the trainer says the dog will walk off leash by the time the training is over, hold them to it. If they don’t want to commit to any results, find someone who will. Since you’ll play a big part in your dog’s behavior after delivery, make sure you know what the trainer expects from you in order to get these results. 3. Do they know how to train and treat a a variety of behaviors and breeds or just a few? Training a puppy with high food drive is one thing, but does the trainer know how to train a dog to walk off leash even if treats and toys aren’t motivation enough? Some trainers will only train certain ages, breeds and behaviors. This is the equivalent of painting by numbers. It shows that the person doesn’t fully understand how to apply dog training techniques to new circumstances. They might be able to replicate some results when the variables are all the same, but the risk is that they will be setting your dog up for other problems without realizing it. 4. Have you seen their results in person? We were always taught not to believe everything we see on TV, and dog training videos are no exception! We use videos as a way to show people our training results online, but there’s no substitute for actually seeing the training first hand. Seeing a live demonstration is the best way to ensure that the behavior you saw in the marketing material was more than a fluke. 5. How good is their in-person demonstration? If the trainer is repeating “Down! Down! Down!” before guiding their personal dog by hand or leash, that’s a red flag. If they can’t make their own dog look good, what chance is there that they can teach your dog and then transfer control to you? 6. How is their training facility? Although you might like the idea of your dog being trained in a home, you want to be sure that you’re going to a professional and not a hobbyist. Many of our clients have been burned by a home dog trainer who suddenly moved away and was no longer there for support. The biggest part of dog training is consistency, so you want to make sure you can rely on the trainer. Try to find a committed trainer who has made the investment in a training facility. The indoor and outdoor space will give them enough room to really work on off-leash obedience training, and you can be sure that friends and family members won’t be handling your dog during the training period and causing progress to backslide. On that note, you also want to be sure that untrained kennel workers or doggy daycare supervisors won’t be handling your dog. 7. Can you see those results outside of the training room? Having training that is functional in everyday life and can be used anywhere is vital. What’s the point of having a dog that’s only well-behaved in your home or a training room? We make sure that each dog will perform as well on a busy street in Newburyport as they do at our training facility. 8. What methods do they use to train? There’s no right or wrong way to train a dog. As long as your dog is enjoying the process of learning lifelong behaviors, go with the methods that are working. Just make sure that the trainer is using something that you will be able to replicate in everyday life. For instance, trainers that rely exclusively on rewarding dogs will not be able to get the same level of control from a distance, and you need your dog to listen even when the treat bag is empty. 9. Are they willing to take (board) your dog if it’s needed? Can they? Every dog learns differently, and while many families would prefer sessions or dog training classes, there are times when the results would be better in a board and train situation. It could be that the dog can focus better with just the trainer, or that the dog requires more frequent training than the owner can be there for. In any event, you want to be sure that if the situation calls for your dog to be boarded, the trainer you are considering has the right accommodations to keep your dog as a guest for a few weeks. 10. How much human training is involved? You know your dog needs training, but have you thought about the training you’ll need to handle and maintain your dog’s training? If you are enrolling in a dog training class, you will likely learn handling techniques during the sessions. If you are choosing to board and train your dog, however, you should ask the trainer what the “delivery” of your trained dog will look like. Will you be taught about your dog’s training in sessions at the trainer’s facility, or will there be an in-home integration component? Click here to schedule a free consultation if you’re interested in off-leash obedience training, puppy training or behavior modification and live in MA or NH.